Juan Seguin: A foreigner in his native land. 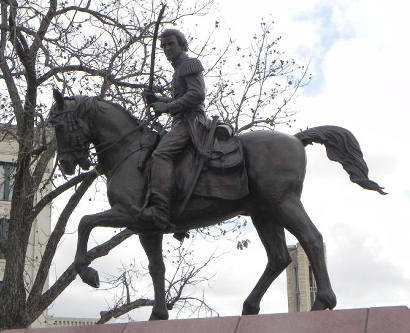 Someone once described Juan Seguin as the Forest Gump of Texas history. That wasn’t meant to imply that Seguin was a simpleton, only that he showed up at iconic moments in the state’s history. How many Texians could say they were at the Alamo and the Battle of San Jacinto? Juan Seguin could. Or how many Texian veterans of those battles would soon after the war be branded a traitor? For many years, Seguin was barely mentioned in textbook histories of Texas. It was hard not to at least acknowledge him but most early Texas history textbooks gave it a good try. Sure, he contributed to Texas’s battle for independence from Mexico on a level comparable to Stephen F. Austin or Sam Houston but neither of those men were Mexican and Juan Seguin was. In the end that made all the difference. Seguin was born in San Antonio in 1806, the son of a public servant. Juan followed in his father’s footsteps, serving as an alderman and on various electoral boards before joining the Texas revolution in 1835. Austin, a political ally of the elder Seguin, made Juan a captain. In December, Seguin was back in his hometown where his company helped take San Antonio back from Gen. Martin de Cos’s army. Seguin was among those who entered the soon-to-be hallowed gates of the Alamo when Santa Anna’s army arrived in town. Because Seguin could speak Spanish and, being Mexican, would not stand out as much as the other men, Travis chose to send him for reinforcements. The Alamo had fallen by the time he returned but Seguin’s unit was at San Jacinto on April 21, 1836, the only Tejano unit present at that pivotal battle. In June he accepted the surrender of San Antonio and served as military commander of that city. Seguin, the only Mexican Texan in the Senate during the republic years, was selected in 1840 to be mayor of San Antonio. Two years later he would lead the defeat of a Mexican expedition to take back San Antonio. The Mexican commander turned the diplomatic tables, saying publicly that Seguin, mayor of San Antonio, mind you, was actually a loyal Mexican subject and had been all along. This was about the time things began to go sideways for Seguin in a hurry. Some of his fellow Tejanos had accused him of being a sellout because he helped Austin bring Anglo settlers to Texas, and he was a land speculator to boot. Many of his former brothers-in-arms turned on him as well, labeling him a traitor. He became a man without a country. Texans didn’t feel sorry for him and neither did the Mexicans. Detained when he returned to Mexico, he was given a choice of imprisonment or service in the Mexican army. He chose the latter and provided fodder for his Texas enemies by serving, under duress he insisted, with General Woll’s invasion of San Antonio. He also fought against the U.S. in the Mexican-American war. The popular press of the day, including the “Telegraph and Texas Register” in Texas and the “Crescent City” in New Orleans, took a hard line against Seguin. The sentiment never completely died down. He returned to Texas six years after being run out of San Antonio by vigilantes and settled on his father’s land in Wilson County. Again, he became active in local politics and again he was accused of being a traitor. He went back to Mexico and died there at Nuevo Leon in 1890, just a few miles from the land he fought to liberate and defend. The town of Seguin is named for him and his name continues to pop up during even a cursory reading of Texas history. History still struggles to understand the true nature of Seguin’s contribution to Texas but he is a key part of that history and always will be, not because of what people thought of him but because of what he contributed. The question he must have asked himself by the end was: Why?